Jezz Goldson-Williams in action for Peterborough Northern Star against Deeping in their FA Cup tie.. Photo: Chantelle McDonald. @cmcdphotos. There’s a humdinger of an early-season United Counties Premier Division game tonight (August 8) when title fancies Deeping Rangers and Wisbech Town clash at the Haydon Whitham Stadium (7.45pm). 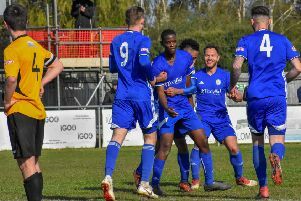 Deeping finished second last season, 12 points and four places ahead of Wisbech, but the Fenmen fancy their chances of a title tilt this season. Zak Munton (stripes) partially hidden scores for Peterborough Northern Star against Deeping Rangers. Photo: Chantelle McDonald. @cmcdphotos..
Deeping boss Michael Goode believes both sides will be challenging for honours come May. Goode said; “We did fantastically well last season – better than I could have imagined – and all we can do now is try to either match or better that. “The club is working to be ready for promotion if we are in a position to win it. We are trying to raise the profile of the club and have worked hard over the summer to attract new sponsors, play prestige friendlies and open our new hospitality suite. “Things are moving forwards nicely off the pitch and we also have a midweek Under 18 side again, which we see as a way of producing our own players. “We have a massive opening game against Wisbech and it’s essential we start better than last season when only taking one point from our first three league matches. “They have clearly invested heavily to try to win the league and the game will be a good benchmark for both clubs. Wisbech already have three points in the back thanks to a narrow ‘Ground Hop’ win over Wellingborough Town. Both teams made progress in the FA Cup at the weekend with Deeping winning at fellow UCL Premier Division side Peterborough Northern Star. Star are back in action tonight at home to Wellingborough Whitworth, but Holbeach United will have to wait to claim their second top-flight win as schedled opponents Boston are in an FA Cup replay. Yaxley also host Division One side Raunds in an FA Cup replay after 1-1 draw between the clubs at the weekend. Tonight’s scheduled Peterborough Premier Division fixture between ICA Sports and Netherton United is off as the former’s Ringwood pitch currently has no goalposts in place. Premier Division: Deeping Rangers v Wisbech Town, Peterborough Northern Star v Wellingborough Whitworth. Premier Division: Holbeach United Res v Moulton Harrox, ICA Sports v Netherton United; Sawtry v Warboys Town, Stamford Lions v Ketton, Wisbech Town Res v Leverington Sports. Premier Division: Peterborough Sports Reserves v Thorney, Deeping Rangers Res v Langtoft United. Division One: AFC Stanground Sports Res v Glinton & Northborough, Crowland Town v Netherton United Res, Kings Cliffe v Wittering Harriers, Stamford Belvedere v Ramsey Town, Uppingham Town v Oakham United Res, Whittlesey Athletic v Peterborough Polonia.